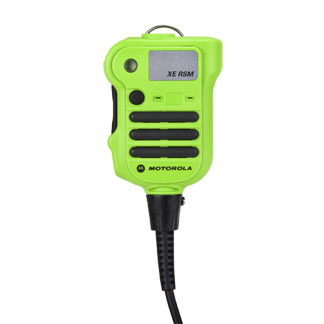 The XE RSM is the first accessory from Motorola with dual microphones that helps suppress interfering background noise. It suppresses noise so effectively, you can be heard in some of the loudest environments--over pumper trucks, crowd noise and wailing sirens. A large speaker delivers audio that is 50% louder and clearer than our existing XTS RSMs. This high-visibility, bright green XE RSM features an asymmetrical shape to help you find the controls without looking, even while wearing bulky gloves. The XE RSM features a large push-to-talk button and an extra-large emergency button that are both easy to locate, but shielded so they’re not set off accidentally when running, crawling or climbing. Easily accessible programmable buttons and a volume switch that ramps up and down make the microphone intuitive to use even in the most demanding conditions. A large d-ring and sturdy clamping clip ensure your APX XE RSM stays attached to your turnout gear. The XE RSM features a strobe light that activates when the emergency button is pressed, casting light up to 10 feet in thick smoke. And if the RSM gets sprayed with a hose or dropped in a pool of water, you’ll see what rugged specs (IP68 submersibility) and a unique water-draining speaker design really mean.